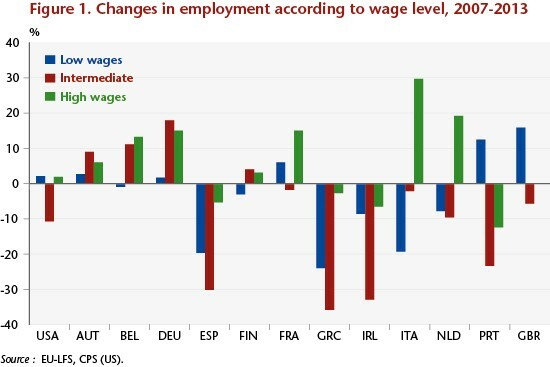 In Europe as in the United States, employment fell considerably during the Great Recession. Moreover, over the last few decades, the labour markets in both regions have been reshaped by the forces of automation and globalization. However, the response of labour force participation to these changes has varied from country to country. One of the most significant developments in the US labour market over the past decade has been the decline in labour force participation. Between 2004 and 2013, the labour force participation rate for the group aged 25 to 54 fell by 2.6 percentage points (from 83.8% to 81.1%), a decline that has persisted well beyond the end of the Great Recession. In the EU-15, on the other hand, the participation rate for this age group increased by 2 percentage points during the same period (from 83.7% to 85.6%), despite low growth and the persistence of high levels of unemployment. What explains these differences on the two sides of the Atlantic? To answer this question, we examine here the determinants of the evolution of labour force participation over the last two decades in twelve European countries and compare this with the United States. Consistent with previous work on the United States, we found that recent demographic shifts account for a substantial share of cross-country differences. The share of retired baby boomers increased more rapidly in the United States and triggered a sharper decline in participation rates there than in Europe. Over the past decade, the rate of increase in the number of higher education graduates was twice as high in Europe as in the United States, especially in southern Europe and in particular for women. 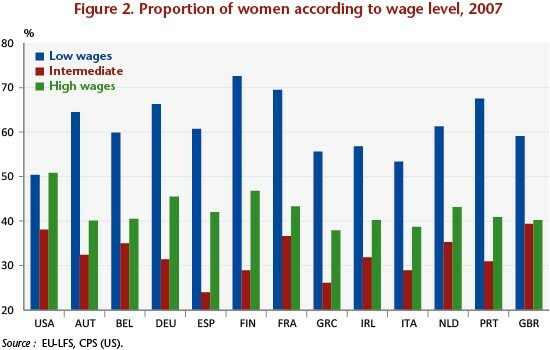 Women with higher levels of education are more likely to join the workforce, and they have contributed dramatically to the rise in labour force participation in Europe. However, these changes do not explain everything. For the population with a diploma below the level of the high school baccalaureate, men’s labour force participation rates have fallen in all countries. For women, they have increased rapidly, especially in the countries hit hardest by unemployment. In Spain, Greece and Italy, the participation rates for women with a diploma below the baccalaureate level rose by 12, 5.5 and 2 points, respectively, between 2007 and 2013, while these economies were in the midst of a deep recession. To explain these facts, we investigated the role of changes in patterns of labour demand in recent decades and in particular during the Great Recession. We show that, as in the United States, job polarization (which denotes the reallocation of employment towards the lowest and highest paying occupations at the expense of intermediate professions) accelerated in Europe during the Great Recession (Figure 1). Due to the greater destruction of jobs in intermediate occupations, the recent polarization has been much more intense in Europe. Another important difference with the United States is that occupational segregation between men and women is more pronounced in Europe. The intermediate jobs that are rapidly disappearing are much more likely to employ male workers in Europe, whereas the expansion of low-skilled occupations is disproportionately benefitting women (Figure 2). As a result, in Europe, more than in the United States, job polarization and the destruction of intermediate jobs has led to a decline in labour market opportunities for men that is more dramatic than the decline for women. We find that these asymmetric demand shocks between the genders accounted for most of the increase in labour force participation rates for women with the lowest educational levels during the Great Recession. ← What factors are behind the recent rise in long-term interest rates?